Starter packs (or starter kits) are a collage of photos, GIFs, text clips, screenshots, colors, and quotes that perfectly illustrate a particular identity, experience, subculture, or abstract concept. 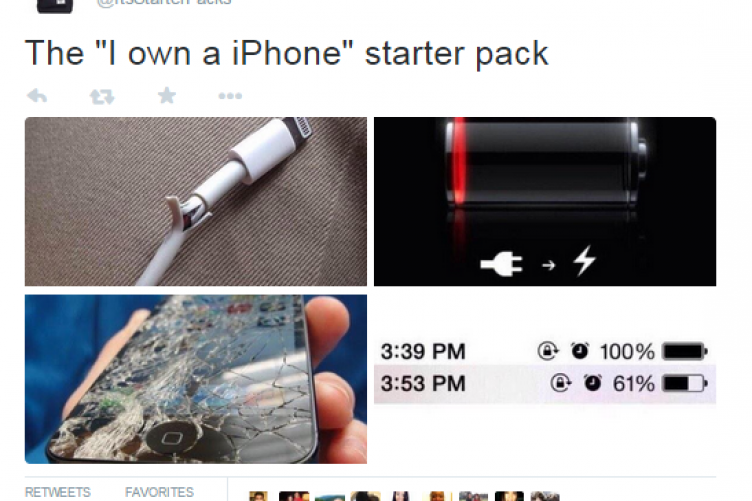 Starter Packs are great for bringing a community together since everyone can relate to the elements in it. A Starter Pack not might make sense to anyone else, but, to members of that subculture, it’s hilarious and nostalgic. The more specific, the better! In this article I will show you how to create a starter pack meme with Kapwing’s free online meme maker to share with your friends, family, colleagues, and/or followers at large. This is a starter pack I made after my first week at Kapwing based on my experiences. The point of a starter pack is to distill the heart and soul of whatever you are describing. They are relatable and engaging because you can customize your starter pack with as many images and quotes as necessary to get your point across. Think about what you want your starter pack to be about. If you already have an idea, great! If you’re struggling for inspiration, try and name elements in your environment and life that others would can relate to. Then, take a look around you and see what jumps out as specific or unique to that element. Photos: Take photos/videos with your phone to represent a typical moment. Images: Find photos/videos through a quick Google Image Search and save them or take screenshots. Videos and GIFs: You can also browse video clips on YouTube or GIFs from Giphy for your starter pack, if there’s some action or animated expression you want to capture. Logos: Save the logos of iconic brands or relevant products. Use Kapwing’s free meme generator to bring all your content together. 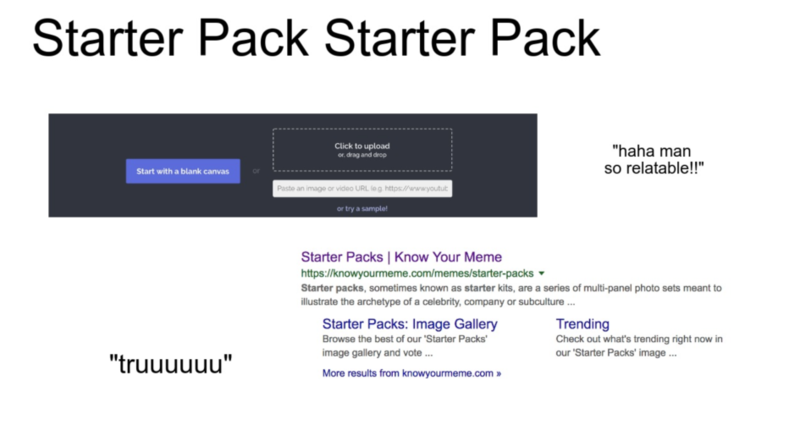 Open the Kapwing meme maker and click the “Get Started” to make an original Starter Pack meme. Because you are going to be adding many smaller images to make up a whole, you want to start with a blank canvas. The default size is square (1:1), but you can click the Resize options to choose other aspect ratios. You can resize for Twitter, Facebook, Tumblr, or other platforms or make a custom size by adding padding. Click the Upload button in the bottom left corner to upload your images, photos, GIFs, and videos. You can upload directly or paste a link to the media, if it’s on YouTube or another site. You can arrange your collage with as many pieces of media as you like. If you have layered media, select images to move forward and back to choose which images will appear on top. Use the Add Text button to add quotes. You can resize or move your media by selecting it. Text layers also have custom font and color options. You can see my fully realized meme coming together! When you are happy with your starter pack, click “Create” and then “Download” to download your very own starter pack. Share it with Instagram, Facebook, Snapchat, your group message, your mom, or in any other way you can think of. If you do post on social media, please tag @kapwingapp so we can see your creative work! We are a small startup, so it’s great to see all the amazing content our users create. To finish off, I’ll add some more starter packs you can browse through for inspiration! Kapwing is an online video editor for casual creators. Kapwing empowers storytellers, influencers, and entertainers to make video with faster, better, more accessible tools. This blog exists to help users better understand the options for editing video online. We hope you enjoy!